In their first year of EU membership, the new EU member states recorded higher GDP growth (5% on average) than in the previous year, largely thanks to expanding domestic demand - in particular of investment and of private consumption. 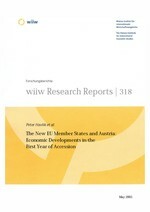 In 2004 GDP growth accelerated also in Austria, in line with the EU-15, yet both growth rates remained nearly 3 percentage points below that of the NMS. The NMS not only add a certain dynamism to the European economy but put some pressure on the EU reform agenda as well. On the downside, the situation on the NMS labour market remains precarious, robust economic growth notwithstanding. The average rate of unemployment is nearly twice as high as in the EU-15 whereas in Austria the unemployment rate is less than half the EU average. Austria and the NMS face numerous challenges regarding labour market developments in border regions, as well as with respect to the labour market position of different skill groups of workers. Overall, the most vulnerable group of employees are those with the lowest educational levels. There are little prospects for marked improvements anytime soon. The latter refers to industry in particular, which - despite a remarkable acceleration of output growth - continues to shed labour. This implies impressive gains in labour productivity and, given the general wage restraint, in unit labour costs as well. The international cost competitiveness of NMS has recently been eroded by appreciating domestic currencies whereas Austrian productivity and cost competitiveness have been continuously improving. After a temporary increase in 2004 (largely caused by tax adjustments prior to EU accession and by rising energy prices), inflation resumed its downward trend in all NMS. The remaining inflation differential with respect to the eurozone, magnified by an appreciation tendency of NMS currencies (often stimulated by short-term capital inflows) may lead to competitiveness losses in the future. Given the ongoing productivity and quality improvements this danger is not yet imminent. Still the exchange rate developments should be watched closely, not least in the period prior to EMU accession, which in several NMS will probably extend beyond 2010. The need to reduce excessive budget deficits represents another challenge for a number of NMS in the coming years. The outstanding feature of last year's economic developments was a boost in foreign trade. NMS exports grew by more than 20%, somewhat faster than imports (+17%), and their aggregate trade balance improved slightly. Yet foreign trade contributed positively to GDP growth in Poland only (as well as in Austria). The export sector of the NMS is strengthening - not least thanks to sustained reforms and large FDI inflows in the past couple of years - and their integration in the European and world economy is increasing. In 2004, 80% of NMS exports and 70% of imports already represented intra-EU trade. After the takeover of EU external trade policies upon accession, especially intra-NMS trade and extra-EU trade are booming. Altogether, the NMS enjoy a surplus in trade transactions with the EU, an achievement largely attributable to the high and growing surpluses of the Czech Republic and Slovakia (and to a lower deficit in Poland). Austria¿s trade with the NMS displays above-average dynamism as well as steady surpluses in both goods and services trade. Austria's services trade has been more diverse with respect to NMS after accession. Travel services are declining in importance, while transport and other business services are on the rise. For the smaller services categories, some degree of trade diversion away from partners in the old EU to NMS can be observed. Trade with the EU may have had a positive effect on GDP growth in the Czech Republic, Poland and Slovakia in the first year of accession; the GDP growth effect of trade with the NMS was positive for Austria as well. The EU's enlargement of May 2004 has brought few surprises and may generally be considered a success. The accession of the NMS was well prepared and managed. Earlier estimates of enlargement effects as a 'win-win situation' for both 'old' and 'new' member states seem to be confirmed. Still, the direct economic effects of accession on the NMS are difficult to identify: economic growth, especially of industry, had speeded up already before May 2004, a temporary increase of inflation was successfully contained and domestic currencies strengthened. Net transfers from the EU budget were negligible, yet foreign trade expanded strongly and inflows of FDI picked up again. The GDP growth outlook is fairly robust: barring major external shocks, the NMS are expected to grow by 4-5% annually in the coming years (the Baltic States will continue to enjoy even somewhat higher growth) thus maintaining their speed of convergence to the 'old' EU. The shadow side of this fairly upbeat economic forecast is the labour market where no substantial reduction of unemployment is expected. Estonia, Lithuania and Slovenia (all already participating in the ERM II) may adopt the euro in late 2006 or early 2007, with the remaining 'high-deficit' NMS following suit during 2008-2010.